Mommy and baby are headed to the park! 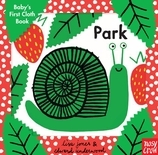 This charming cloth book combines bold images of faces and animals, high-contrast patterns, first words, and the simplest of stories, making it a perfect gift for babies. Features a cloth and Velcro handle that can be strapped to a stroller and crinkly pages for tiny hands. 8 / 6 1/2" x 6 5/16"
Lisa Jones began designing and hand-printing her own line of greeting cards with the help of her partner, Edward Underwood, in their London studio in 2000. Drawing on their backgrounds in art and fashion, they've since stocked the world's finest galleries, museums, boutiques, and department stores with stylish wares. Lisa Jones and Edward Underwood live in the South Downs, in England.